The National Social Security Fund (NSSF) is a quasi-government agency responsible for the collection, safekeeping, responsible investment, and distribution of retirement funds from employees of the private sector in Uganda who are not covered by the Government Retirement Scheme. Participation for both employers and employees is compulsory. In February 2009, the President of Uganda fired the minister of finance, whose ministry supervises the activities of NSSF. Also terminated were the managing director of the NSSF and his deputy. A new board of directors and a new management team were appointed in 2009. In late 2010, NSSF underwent a restructuring process aimed at making it more efficient, competitive, and responsive to the needs of its members. It was then poised to provide a wide range of social security products and be the lead institution for domestic capital formation and deepening the financial sector. Analysts in the country said in 2013 that the NSSF had become a leading player in the country's economy. In July 2018, the fund's investments included (a) fixed income investments, accounting for 77 percent of all investments (b) equities on the security exchanges of the East African countries, accounting for 17 percent and (c) real estate investments, which are 6 percent of the total portfolio. Significant real estate holdings include Workers' House in the centre of Kampala, Uganda's capital city, where NSSF maintains its head office, and City House Jinja, in Jinja, developed between 2015 and 2018, at a cost of USh3.5 billion (approx. US$1 million). Emigration grant: Paid to a member who is leaving Uganda permanently. The NSSF's total assets as of 30 June 2014, were valued at UGX:4.4 trillion. :15 In October 2017, The Independent, a Ugandan English language newspaper, estimated the NSSF total assets at USh7.9 trillion (approximately US$2.48 billion at that time), as of 30 June 2017. By June 2018, those assets had increased to USh9.98 trillion ($2.678 billion). Beginning in the early 2000s, NSSFU has been developing an office complex known as Pension Towers, along Lumumba Avenue, on Nakasero Hill, one of the most prestigious neighborhoods in Kampala, Uganda's capital city. The complex consists of three interconnected towers; one central tower of twenty-five stories in height, flanked on either side by a ten-story tower. Roko Construction Company, a Ugandan construction company constructed the four basement floors between 2008 and 2012, but failed to qualify for further works on the project. Three Chinese firms are in a final bidding process to complete the construction, between 2012 and 2015. Construction costs for the complex are estimated at UGX:260 billion. When finished, the three towers will contain in excess of 59,410 square metres (639,500 sq ft) in office space. Parking for over 500 vehicles will be provided in the development. Richard Byarugaba: Managing Director and CEO. Jean Mutabazi - Head of Operations. As of December 2018, NSSF had a branch network of 19 branches in the central, eastern, northern, and western parts of Uganda, with six in Kampala, the capital. ^ a b c Martin Luther Oketch (28 August 2018). "NSSF to pay 15 % interest to its members". Daily Monitor. Kampala. Retrieved 28 August 2018. ^ Busuulwa, Bernard (27 August 2018). "New members, rising interest rates boost NSSF-Uganda income to $425 million". The EastAfrican. Nairobi. Retrieved 18 October 2018. ^ Businge, Julius (19 March 2018). "Uganda: Who Wins in the Proposed NSSF Monopoly?". The Independent (Uganda) via AllAfrica.com. Kampala. Retrieved 21 March 2018. ^ Press TV Ireland (17 February 2009). "Uganda First Lady named cabinet minister" (Archived from the Original). PressTv.com. Retrieved 22 June 2018. ^ Martin Ssebuyira, and Al-Mahdi Ssenkabirwa (14 May 2012). "Workers give government 14 days to name new NSSF board". Daily Monitor Mobile. Kampala. Retrieved 22 June 2018. ^ Busuulwa, Bernard (3 April 2009). "NSSF turns to fund managers". The EastAfrican. Nairobi. Retrieved 22 June 2018. ^ Kidimu, Gilbert (12 September 2013). "Workers to Benefit From Pension Reforms". New Vision. Kampala. Retrieved 22 June 2018. ^ Kyatusiimire, Sharon (28 June 2018). "NSSF Launches Shs3.5 Billion Building In Jinja". Kampala: Chimp Reports Uganda. Retrieved 5 July 2018. ^ Staff Writer (2 July 2018). "Kadaga Opens NSSF'S Jinja Office Complex". Red Pepper. 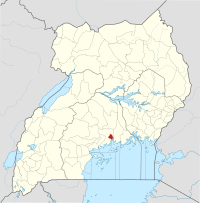 Mukono. Retrieved 5 July 2018. ^ a b c d e Uganda Auditor General (29 October 2014). "Financial Statements for the Year Ended 30th June, 2014, Together with the Report and Opinion Thereon of the Auditor General" (PDF). Kampala: Uganda Office of the Auditor General. Retrieved 22 June 2018. ^ Businge, Julius (9 October 2017). "NSSF sees higher returns for savers in FY 2017/18". The Independent (Uganda). Kampala. Retrieved 22 June 2018. ^ Mugabe, David (23 May 2012). "NSSF constructs Uganda's tallest tower". New Vision. Retrieved 14 October 2015. ^ NSSFU (2011). "Pension Towers to reduce office space shortage in Kampala". NSSF Uganda (NSSFU). Retrieved 14 October 2015. ^ Kamukama, Eronie (5 December 2018). "New NSSF board outlines plans". Daily Monitor. Kampala. Retrieved 9 April 2019. ^ a b Wesaka, Anthony (8 April 2019). "Government completes NSSF board appointments". Daily Monitor. Kampala. Retrieved 9 April 2019. ^ NSSF (10 February 2018). "NSSF Management". Kampala: Uganda National Social Security Fund (NSSF). Retrieved 10 February 2018. ^ Vision, Reporter (29 October 2014). "Byarugaba bounces back as NSSF boss". New Vision (Kampala). Retrieved 14 October 2015. ^ Nakaweesi, Dorothy (14 March 2019). "Kasaija appoints new NSSF head of legal services". Daily Monitor. Kampala. Retrieved 29 March 2019. ^ NSSF (December 2018). "Branch Directory". National Social Security Fund of Uganda (NSSF). Retrieved 10 December 2018.